The aim of this competition is to directly involve young academics in an open and argumented debate on important aspects of the accession process and the Republic of Serbia’s membership in the European Union. 1. What challenges and factors affect Serbia’s accession process? 2. How does the European integration process create and support Serbia’s reform potentials? 3. What is appealing about the European idea, the European integration project, the EU social model and the EU model of values? 4. What are the prejudices about Serbia’s European integration and how can they be overcome? 5. What kind of reformed European Union should a reformed Serbia join? 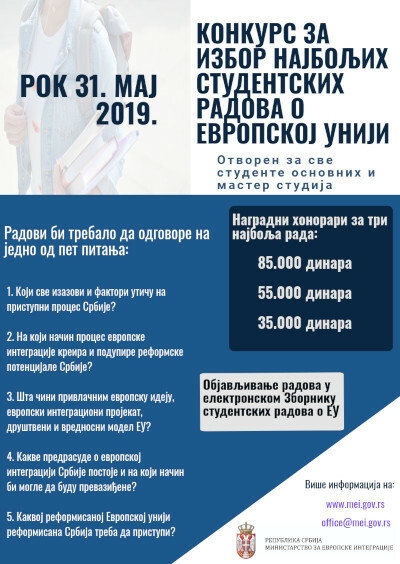 The competition commission composed of professors from the University of Belgrade will assess the quality of submitted papers, and the authors of the three best papers will be rewarded with RSD 85,000, 55,000 and 35,000, respectively. In addition to the three top-ranked papers, papers that meet the criteria will also be published in the online Collection of Student Papers. The competition is open to students of basic academic studies and master academic studies of all universities in the Republic of Serbia. The deadline for the submission of papers is 31 May 2019.